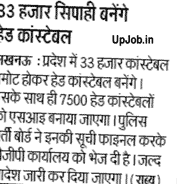 Uttar Pradesh Police Recruitment and Promotion Board (UP PRPB) is going to give promotion to 35000 Constable of the state. All Constable /Sipahi will be promoted on the post of Head constable HC (Mukhya Aarkshi). At the same time, 7500 Head Constable will be promoted to the post of Sub Inspector (SI). Uttar Pradesh Police bharti avam pronnati board has finalized the Promotion list and information and sent it to the DGP's office. Early promotion orders will be issued. All important information related to Uttar Pradesh Police Recruitment and Promotion will be made available here on UPJob.in. Therefore, all the candidates are advised that they continue to visit this website, so that we can send you information related to the promotion immediately. The list of promotions will also be released online, which all cop, head constable can download in PDF file and view. You can also see this list from the Uttar Pradesh Police Department's official website. As soon as the DGP releases the list of office promotions, we will first try to make you available here. You can also download the list from Uttar Pradesh Police Recruitment and Promotion Board website from the link given below. No dates have been announced for the promotion list, but as soon as we receive the news, we will try to make it available to you here. To view a website related to Uttar Pradesh Police Recruitment, please click link below.